Home » Posts Tagged "iPhone 6"
Clever Clever. Seen on Scene. 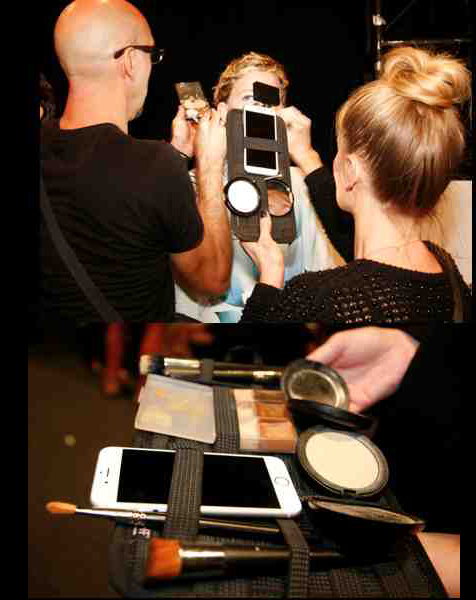 Some smart Mac makeup artists used a smart phone mounted with handy makeup and brushes to perfect the makeup on models backstage just before the shows started. The lighting was equivalent to that of a powerful camera and it stayed steady bathing the model’s face with flattering and practical light. We saw the iPhone 6 and Galaxy in use and photographed a model getting a finishing touch up at the #AAU #NYFW show. We also photographed a close-up (bottom) of one in use at the Badgley Mischka show for Spring 2015. Inspiration for all makeup artists backstage. Brilliant.